A top police officer believes racist abuse in the north-east is becoming as unacceptable as drink-driving – but acknowledged more needs to be done. 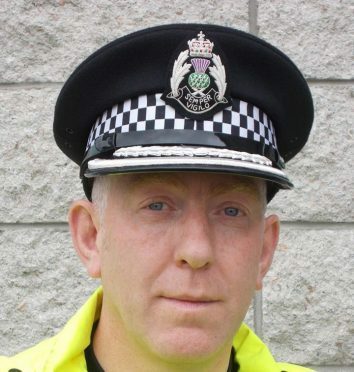 Chief Superintentent Campbell Thomson told yesterday’s public protection committee there was still “a way” to go before “turning a corner” on tackling racial hate crimes. However, he suggested there has been a change of attitude, meaning people are far more likely to step in if a friend made an offensive comment – as they would if they thought about getting behind the wheel after a drink. Mr Campbell was speaking in relation to a report from the north-east division on hate crime, which showed that during 2017/2018 416 were reported to the north-east division – a rise of 33 from 2016/2017. A total of 256 were reported in Aberdeen alone. Hate crime is classed as an offence motivated by race, sexual preference or religion. Mr Thomson added that many incidences of hate crime were “fuelled by alcohol” and happened “on the spur of the moment” and were often directed at the emergency services. He said more education was needed for people to understand acceptable behaviour. Quizzed on how far he thought there was to go on tackling the issue, he compared it to the changing attitudes about drink-driving. He said: “I suppose I reflect on drink driving, once upon a time there was a view that it may have been acceptable – although it never has been. “We talk about statistics but every statistic is a victim, and I think it is too early to say we have turned a corner. Tougher new drink driving laws were recently introduced to Scotland aiming to curb down on the drink driving culture. Committee member Martin Greig said: “Drink driving wasn’t common – just normalised. There was a lack of awareness of the harm and safety implications. “When the police respond to incidents and deal with issues they are superb. People get used to casual racism so do not bother reporting it. “It is crucial not to get complacent because individuals should not suffer because of their nationality, race or religion. Committee convener Jennifer Stewart said that now many people did not allow friends to drink and drive.